Chicago, IL – September 12, 2017 – Quadrant Engineering Plastic Products (Quadrant EPP), leading global supplier of high-performance thermoplastic materials, will be attending PROCESS EXPO 2017 this September to showcase innovative thermoplastic solutions for the Food Processing, Packaging, and Conveyance Industries. PROCESS EXPO 2017 attracts professionals from all segments of the global food and beverage industry who are in search of processing and packaging solutions, including individuals in engineering, operations, maintenance, production, R&D, quality assurance, marketing and sales, and corporate management. The four-day event will feature speaking sessions by experts from some of the top university food science programs in North America, who will address critical topics for food processors and beverage manufacturers. Environmentally sensitive and highly regulated, the food production and packaging sectors require specific solutions. Quadrant’s portfolio of materials developed for food contact, including a newly developed “Food Grade” family, aim to reduce maintenance costs and increase productivity while keeping consumer and employee safety at the forefront. 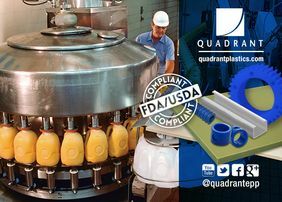 Quadrant’s food compliant materials—FDA, CFIA, NSF, USDA, 3A-SSI, and ED STD certified—provide improved productivity and product lifetime through reduced friction and wear. Self-lubricating formulations lower maintenance costs and lower the risk of lubrication contamination. Learn more about Quadrant EPP’s innovative family of food compliant thermoplastics at PROCESS EXPO 2017 (booth #3811 - North Hall) at McCormick Place in Chicago, Illinois from September 19-22, 2017. Application specialists and technical experts will be available on-site to answer questions and provide guidance.